A total of 806 entries were made in the 2017 World Poker Tour Bay 101 Shooting Star $7,500 no-limit hold’em main event, a record field for the unique event that dates back to the second season of the WPT. This year’s six-handed final table played the host to a number of exciting storylines, including Chino Rheem looking to become the first-ever four-time WPT main event champion and two-time bracelet winner Paul Volpe going for his first title on the WPT at his third final table. In the end, the storyline that won out was Sam Panzica capturing his second title on the tour less than six months after winning his first. Panzica overcame the record field and the stacked final table to emerge victorious, earning the first-place prize of $1,373,000 and adding his name the WPT Champions Trophy. 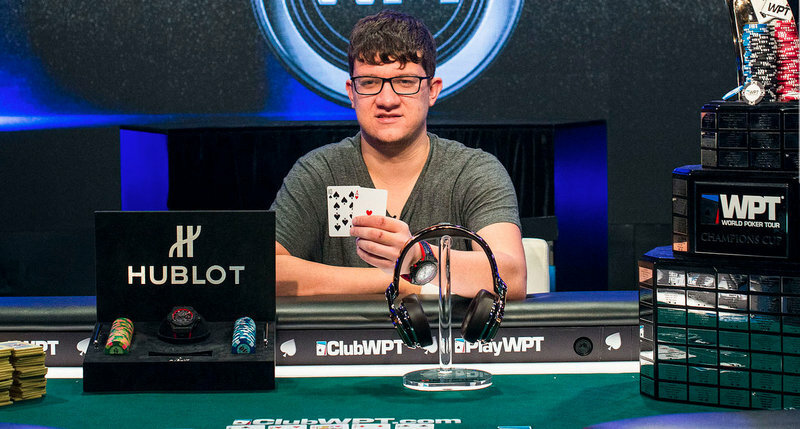 Panzica’s prior win came in the WPT bestbet Jacksonville Bounty Scramble for $354,335. This second win came in a larger buy-in event with more than double the entries, and as a result Panzica found it accordingly more rewarding. “This one is definitely better. First place is four times as much as Jacksonville,” Panzica told WPT reporters. “But Jacksonville was cool though since it was my first one." Panzica came into the final table of six in third chip position, although he had only 40 big blinds while chip leader Chino Rheem had over 130. Rheem also scored the first two eliminations at the final table, sending Rainer Kempe (6th – $188,460) and Dennis Stevermer (5th – $243,090) to the rail and increasing his stack to more than 11 million with roughly 24 million in play. Rheem continued his run of knockouts by sending Paul Volpe home in fourth place ($349,610) but in the meantime Anthony Spinella had won some key pots and began to challenge for the lead, which the two traded back and forth while Panzica simply tried to stay alive in the event as the shortest stack. The three battled it out for quite a while, with Panzica able to slowly mount a comeback and get himself back into the thick of it. On the 151st hand of the final table Panzica picked up A A and got all in preflop against Rheem’s Q J preflop. Panzica held to take the lead from Rheem, who had been pulling away again. From there on Rheem was on a downward spiral, losing another key pot to Panzica to fall to just 12 big blinds. Shortly after that Spinella double up through him, leaving him on fumes. Rheem hit the rail the following hand in third place, earning $521,660 for his deep run. With that the heads-up showdown was set, with Panzica holding more than a 3-to-1 chip advantage over Spinella. The final battle lasted only five hands, with Spinella getting his last chips in with A 8 only to run into Panzica’s A 10 . The board ran out J 5 3 4 5 to secure the pot and the title for Panzica, sending Spinella to the rail as the runner-up with $786,610. In addition to the trophy and the money Panzica also earned 1,824 Card Player Player of the Year points for the win. This was his second final table finish of 2017 and it was enough to see him move into fourth place on the POY leaderboard, which is presented this year by Commerce Hotel & Casino. Winner photo courtesy of Joe Giron / WPT.